Joseph B. Fuirita joined the firm as a Summer Associate in 2014, staying on as a clerk throughout the remainder of his time in law school and gaining valuable experience in the diverse needs of Schiller, Pittenger & Galvin, P.C.’s clients. While in Law School, Joseph served as an Intern to the Honorable Ellen L. Koblitz, J.A.D., was a member of the Seton Hall Circuit Review Journal and was recognized by the New Jersey State Assembly for his volunteer work in the Southern District of New York representing indigent clients. Following his graduation from Seton Hall University School of Law, he served as a Law Clerk to the Honorable Margaret Mary McVeigh, P.J.Ch., the presiding Chancery Judge in Passaic County, assisting the Court in cases involving corporate, foreclosure and banking law, as well as probate and estate matters. 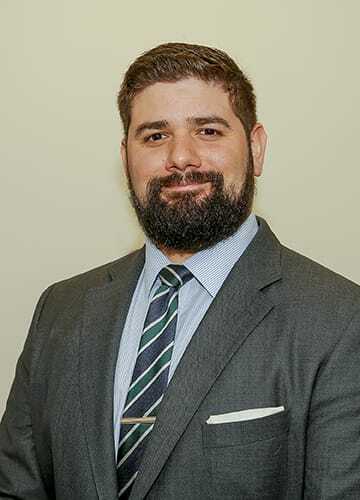 After his clerkship, Joseph began his career as an associate in the general litigation department of a large regional law firm, before returning to Schiller, Pittenger & Galvin, P.C. to practice in the areas of Estate Planning, Transactional and Corporate Law. Joseph is a graduate of Johns Hopkins University. Prior to attending Law School, Joseph served as a Teach for America volunteer, teaching Kindergarten in Newark, New Jersey. He was the recipient of Seton Hall Law’s prestigious Teach for America Scholarship.